It might’ve taken a little while to happen, but there are now people who are finally admitting that Sharia Law-loving, faux feminist Linda Sarsour and race-baiting, faux feminist Tamika Mallory — among others — aren’t fit to lead the Women’s March anymore, if they were even mentally fit enough to do it in the first place. 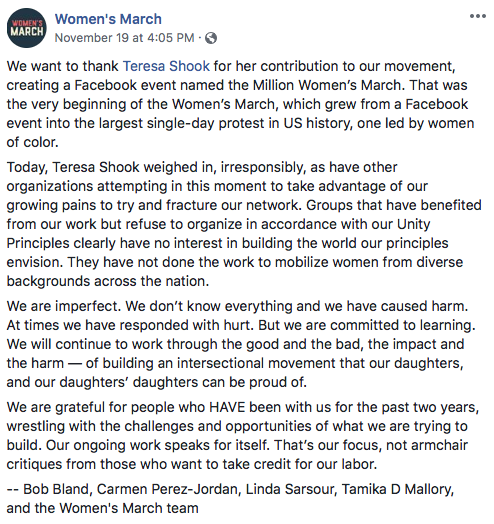 Founder of the Women’s March Teresa Shook posted a statement to her Facebook page on Monday indicating that she’s not happy with the direction Sarsour, Mallory, and fellow co-founders Carmen Perez and Bob Bland have taken the movement into. 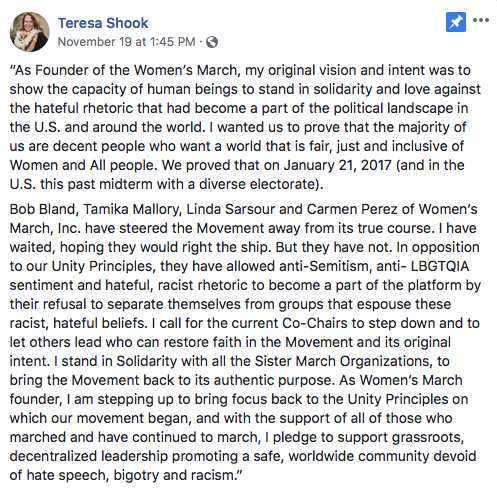 Shook wrote that the group of co-founders “have allowed anti-Semitism, anti-LGBTQIA sentiment and hateful, racist rhetoric to become a part of the platform by their refusal to separate themselves from groups that espouse these racist, hateful beliefs.” She even called for all of them to “step down” as co-chairs. While I still don’t agree that there even needs to be a Women’s March movement, it was pleasantly surprising to see someone at the top of the movement call out those that haven’t helped the movement in the least. The bottom line is that Shook is a “social justice warrior,” even though people have completely misused the word “warrior.” We’re going to continue to see social justice protests, modern feminists gathering to squawk about what they don’t have that they feel “entitled” to, and large gatherings where people don’t really know what they’re protesting about. Rinse and repeat. Giving the movement focus might make it slightly less annoying, but until they can answer questions with facts rather than emotions, it will continue to be a fruitless endeavor. I was at the Women’s March in Washington D.C. in January of 2017, and what I saw astounded me — and not in a good way. Confused children as young as three or four held up vulgar signs that their “woke,” irresponsible parents made them hold up. Grown women yelling at the top of their lungs for men to get out of their way. You know — unity. Celebrities conveying that they've "thought an awful lot about blowing up the White House." The message that Shook supposedly wanted to drive the movement was bastardized by organizations like Planned Parenthood, aiding in the loss of what the true meaning of equality is. Let’s put it this way. I’ve encountered many modern feminists in my time doing this, and I can honestly say that not one of them has been able to give me a substantive answer as to what rights men have that women don’t.